Born into slavery, William Hooper Councill founded one of the nation's first HBCUs, Alabama A&M University. 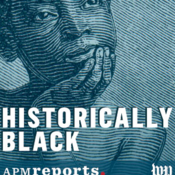 Negotiating the racial politics of Reconstruction and the dawn of Jim Crow was dangerous work. Councill was a peer of Booker T. Washington's and is remembered for his accommodating stance toward whites. His complicated story helps us understand the times he lived in and the legacy of HBCUs. Racial identity in the U.S. is complicated because race is an invented category rooted in slavery. This episode explores the question of black identity in America through the voices of four people who, at one time or another, have had to answer the question: What are you? James Van Der Zee was a celebrated African American photographer who documented black New York for much of the 20th century. Van Der Zee was New York's leading black photographer during the Harlem Renaissance. His images emphasized the dignity, beauty and prosperity of black people at a time when the dominant culture didn't. A young musician and actor discovers that his great, great grandfather was Bill Driver, a celebrated fiddler in Missouri. Family members recall how his fiddle playing often brought blacks and whites together at country dances and fiddle contests, and describe his legacy today. The family's story also highlights the complicated nature of inter-racial mixing in the Jim Crow era.